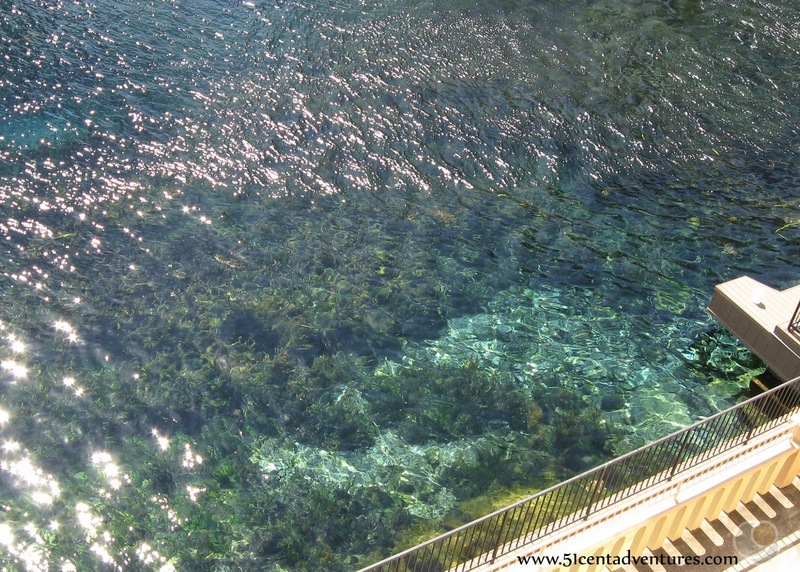 The water from the Edwards Aquifer is perfectly clear as it flows out of over 1000 springs into Spring Lake. Since 1945 people have been able to see into the depths of the water by taking tours on glass bottomed boats. 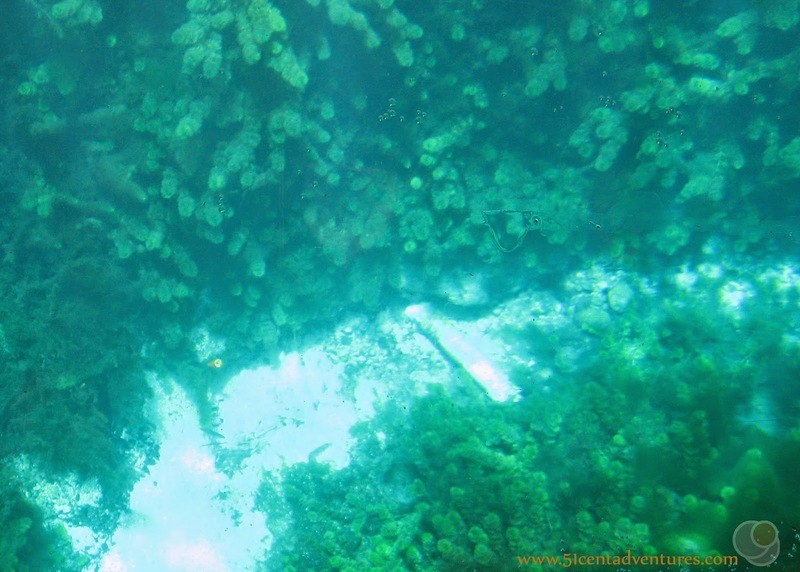 You can see all sorts of fish, turtles, and even flowering plants under the water. Cost: Boat rides are $9.00 for adults, 7.50 for seniors, $6 for children ages 3-12, and free for children under 3. There are also glass bottom kayak tours for as low as $20. The Meadows Center has displays and aquariums that you can look at for free. Operating Hours: Hours vary according to the season, but usually tours run from 9:30 am to 5:00 every day. The tours last 30 minutes and depart approximately every half hour. Recommendation: The best way to see what's underwater without getting in the water yourself. My husband and I moved to Texas in January of 2013. He was able to take leave in March and we decided to go on a road trip and do a little exploring in our new state. I asked my Facebook friends for suggestions on what to see and do. One of my friends suggested going on a glass bottom boat tour at Aquarena Springs. After a quick Google search I discovered that Aquarena Springs would be on our way home from San Antonio. I also realized that this would be a very unique experience. Water from the Edwards Aquifer comes out of over 1000 springs to form Spring Lake. 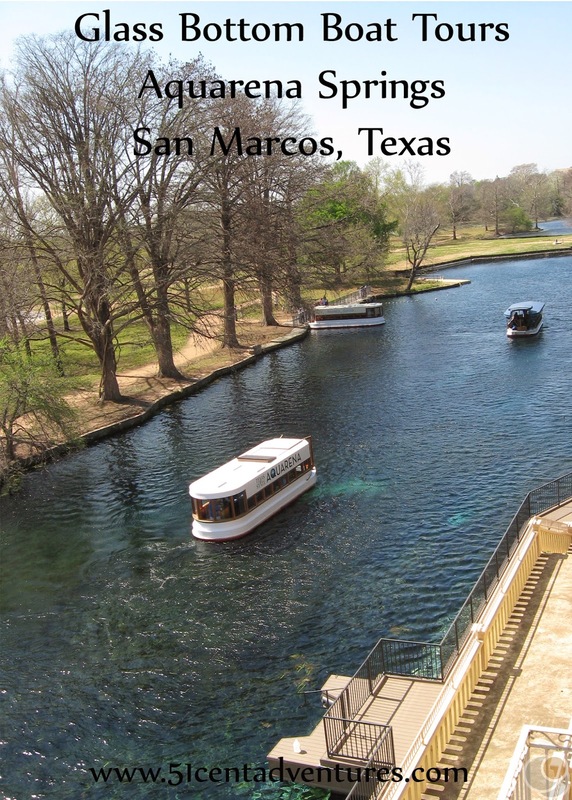 Spring Lake is the beginning of the San Marcos River which flows for 75 miles before flowing into the Guadalupe River. Since Spring Lake is where the water first reaches the surface it is perfectly clear. 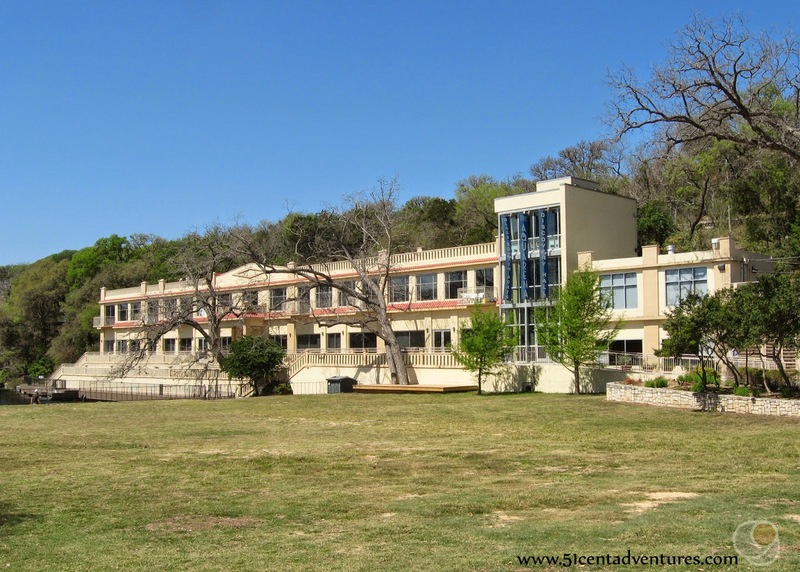 A resort was opened on the edge of the lake in 1926. 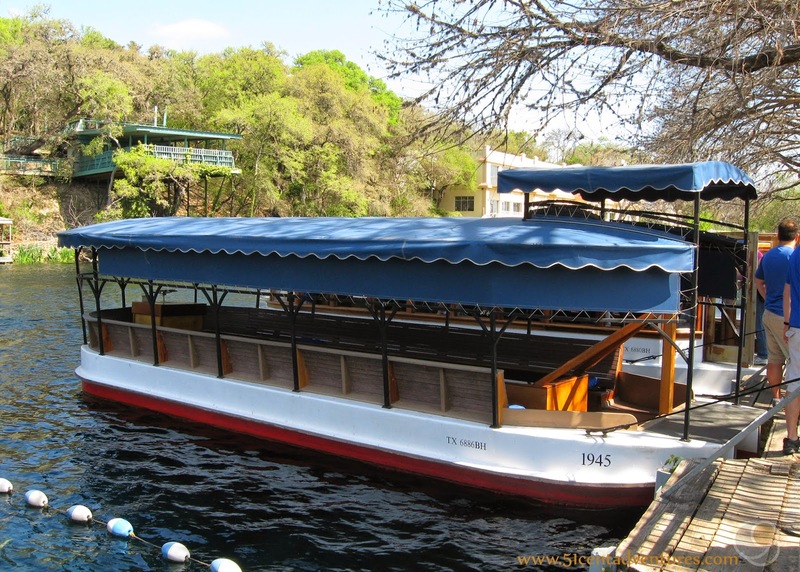 In 1945 the resort started building boats with glass bottoms, and started providing tours so people could see the springs and the underwater ecosystem. Four of those boats are still in use today. My family was assigned to the boat that was built in 1945. The bottoms of the boats aren't completely made of glass. The glass is actually at the bottom of a long trough that is inside the boat. Passengers sit on seats that surround the trough. You can lean over the edge of the trough and look through the glass into the lake. Spring Lake isn't very big. At first I wondered if we would see anything all that interesting under the water. However, as soon as the boat started moving I realized that there was a whole other world down there. The tour was amazing. As our guide piloted the boat around the water he took us over many of the small springs. We saw many fish and turtles swimming in the water. It was like staring into an aquarium. We also saw many plants. Some of the plants had flowers on them. The water was so clear that the plants received enough sunlight that they didn't realize they were underwater. There was plenty to look at above the water as well. The boat's sides were open which let us have a good view of the birds that were near the water. I was worried that my three toddlers might decide to launch themselves over the side of the boat so I kept a firm grip on them. Near the end of the 30 minute tour, the guide took us over the largest of the springs. He indicated where a pipe was inserted into the spring to help measure the amount of water flowing from the spring. I apologize for my camera quality. This is the best shot I could get through the thick glass. In person it was much clearer. The pipe is in the middle of this picture. 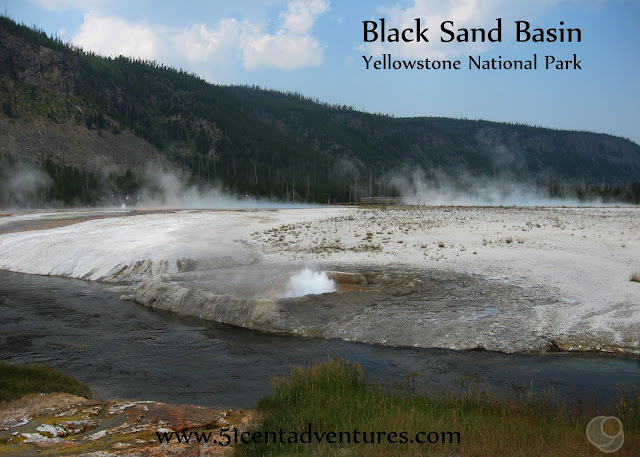 The white part of the picture is sand and rock that is exposed by the water constantly flows through the spring. After the tour we went to the Meadows Center for Water and the Environment to look at the displays in there. The building was originally the hotel for the resort. Now it holds aquariums and interpretive displays about the springs. 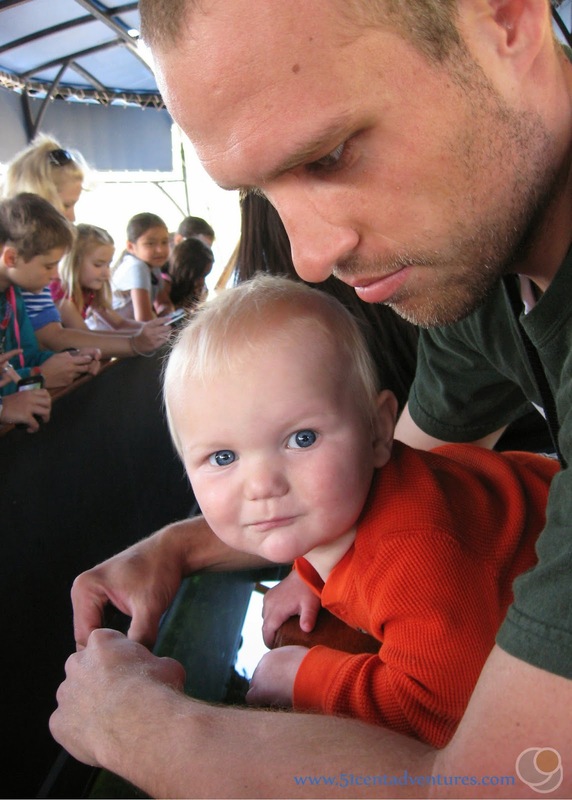 I liked the aquariums because my kids were able to notice the fish much easier than they had in the boat. The Meadows Center is free to visit. The roof of the Meadows Center is accessible to the public. It offers a great view of the surrounding area and the lake. You can see straight down into the clear water. Visiting Aquarena Springs and taking a glass bottom boat tour was one of my favorite parts of our vacation in 2013. In fact, I think this place is on my top 10 favorite places list. I loved how unique of an experience it was to peer into an underwater world. Directions: Aquarina Springs is located on the west side of I-35. Take exit 206 off of I-35 and turn onto Aquarena Springs Drive. Turn right onto Post street. You will drive through a golf course. Then turn left onto Spring Lake Drive. The entrance to the parking lot is right off of Spring Lake Drive. There is a little building to the east of the parking lot where you can purchase tour tickets. The Meadows Center is to the north of the parking lot. Additional Information: Spring Lake is the launch site for the Texas Water Safari. A canoe race from the San Marcos River to the town of Seadrift on the coast of the Gulf of Mexico. The total distance of the race is 260 miles and the participants have four days and four hours to complete it.